Thank goodness Cafe Hue came and took over that other froyo place. Cafe Hue is next to the Nijiya market and is a nice little dessert cafe. It serves coffee, tea, milk teas, and snacks. What you really come here for is their snacks: waffles and crepes! Although you will see froyo machines as you enter, I urge you to step past them and head to the counter. From there, you will see displays and pictures of the possibilities: freshly made waffles and crepes! I was initially worried that they were buying pre-made waffles and crepes. 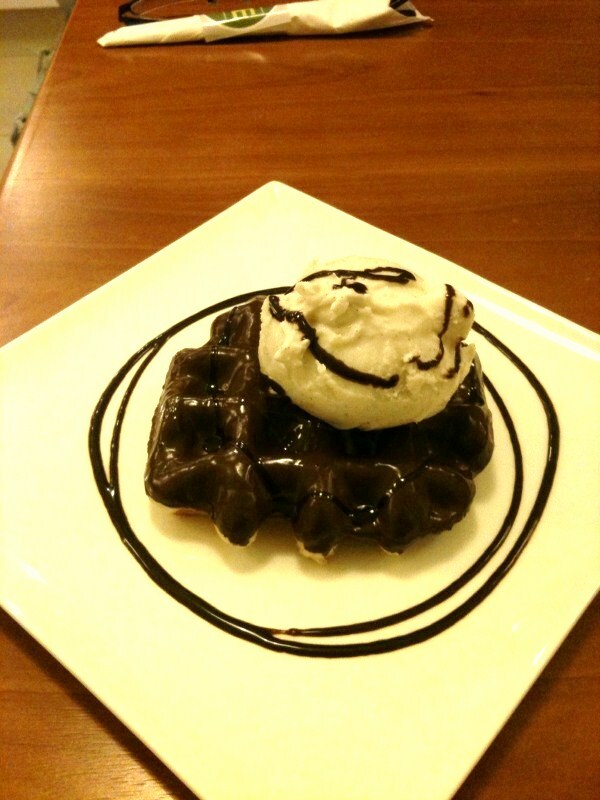 However, my worries soon disappeared when I saw the batter for the crepe and the tray of dough to make the waffles. I tried my friend’s red bean crepe and it was good. 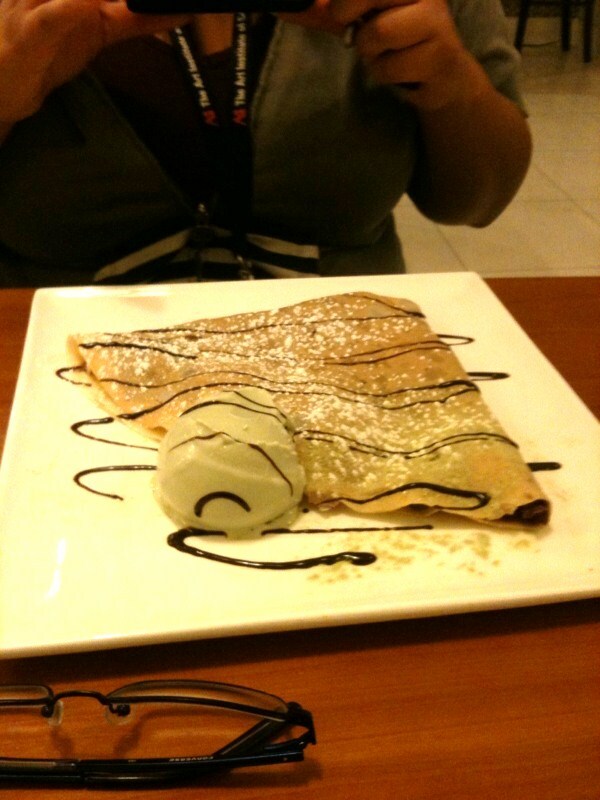 However, I think I am still partial to my favorite crepe combo (nutella, banana, and coco). What really rocked my world was my chocolate dipped waffle. The waffle was nice and soft, not quite like the Belgium waffles that I’ve had, but still delicious. Since it was freshly dipped, the chocolate was still soft and melted in my mouth. Once the chocolate harden, it added a nice crunch to the bite. And the gelato was a very nice complement to it ($1.50 extra). All of our desserts came out to be about $5-7 each. I would definitely add this to my quick, cheap dessert stop. I love this place’s use of light everywhere. The light up counter was a nice touch. And here’s the toppings bar where they have a variety of jellies, fruits, cereal, and traditional ice cream toppings too. And this is the counter where the magic of Fro-Yo happens! They have 4 flavors: Plain, Green Tea, Taro, and Raspberry-Pomegranate. I didn’t try the plain or green tea flavors, but I did try the other two. Actually, even though I ended up choosing taro – which was actually not that overpowering as most anything taro are – I found the raspberry-pomegranate to taste better of the two. Ok, so this place works like any other (non-self-serve) yogurt joint: You pick a size, one flavor, and one topping. Any additional toppings will cost you about $0.55 I think, I can’t remember…in fact this was several weeks ago so I can’t really remember the prices for the other cup sizes but for my yogurt (a small cup with one topping) it cost $3.75. The taro flavor I got was subtle and the yogurt base was actually fairly icy. It was really hot so it was highly welcomed. With my yogurt, I choose the mango star-shape jellies. I thought Frutti Yogurt was not that bad especially if you want a cool dessert on a hot summer day. However, I prefer Yogurt World on Convoy over Frutti but Frutti gets brownie points for their not too sweet taro yogurt. Also, the woman that was working that day was very friendly and was more than happy to let me take pictures of the store after I told her what it was for. So if you are in the La Jolla area, come here for a quick, cool treat!